Even though they are actually competing against each other, you can still call the decathletes a big family. They help each other, they cheer for each other, they celebrate victories together. They are not rivals but friends, something you will see in no other discipline, at least not to this extent. It's quite rare for example, that two big rivals for a gold medal practice together, like Sebrle and Clay did before the World Championships in Helsinki. 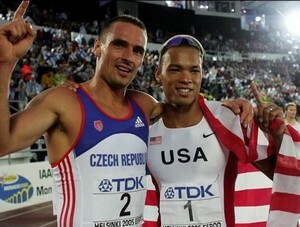 Traditionally, all decathletes who finished the event do a round of honour together after the competition.